Baja Dog Rescue is still in desperate need of donations to continue our efforts of treating abused, neglected & abandoned dogs in the Baja area. Enya was brought to us recently in very, very bad shape. Please be aware the image of Enya is graphic. For Enya to end up like this; can you imagine how many people must have walked past her every day and did nothing? Enya did nothing to deserve this kind of poor treatment. 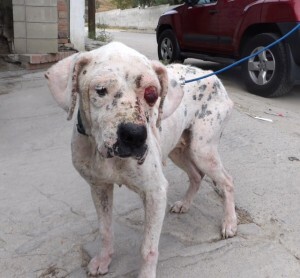 Now that she is in Baja Dog Rescue’s care, she is already scheduled for an ultra sound, Enya has had x-rays done, blood work & tests were sent out for tick borne illnesses as well as Distemper. Clearly one of her most serious conditions is her eye abscess that is horribly infected and has gone untreated for far too long. Enya will receive all of the necessary care and love she needs to recover but we cannot help others like Enya without your help.